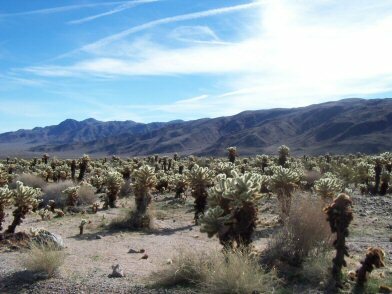 Nearly 800,000 acres of California desert are preserved here. 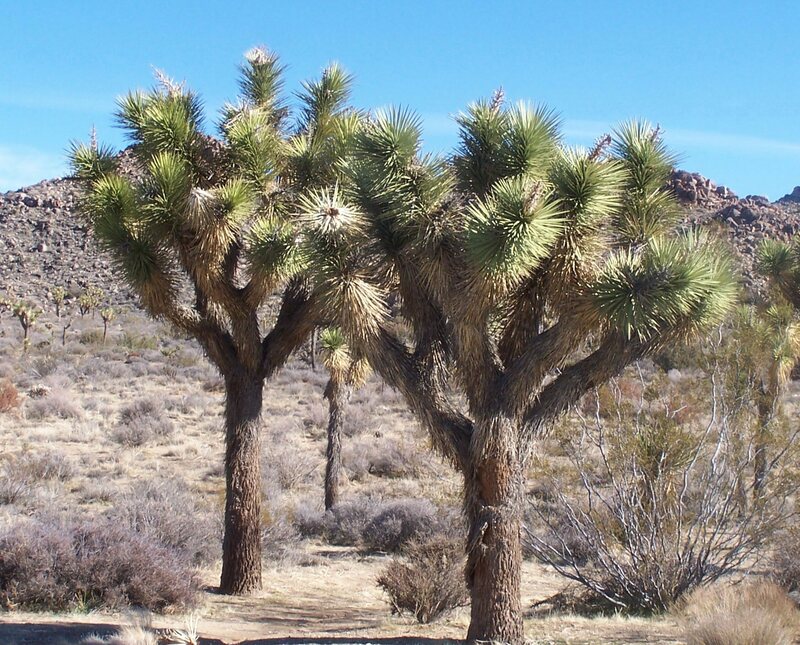 Two deserts, actually, for both the Mohave and the Colorado subset of the Sonoran desert are featured in Joshua Tree National Park. The desert is a land of contrasts: immense and variable, yet fragile and delicate. It's shaped by torrents of rain and long periods of dry weather. The land may appear lifeless, but the opposite is true. 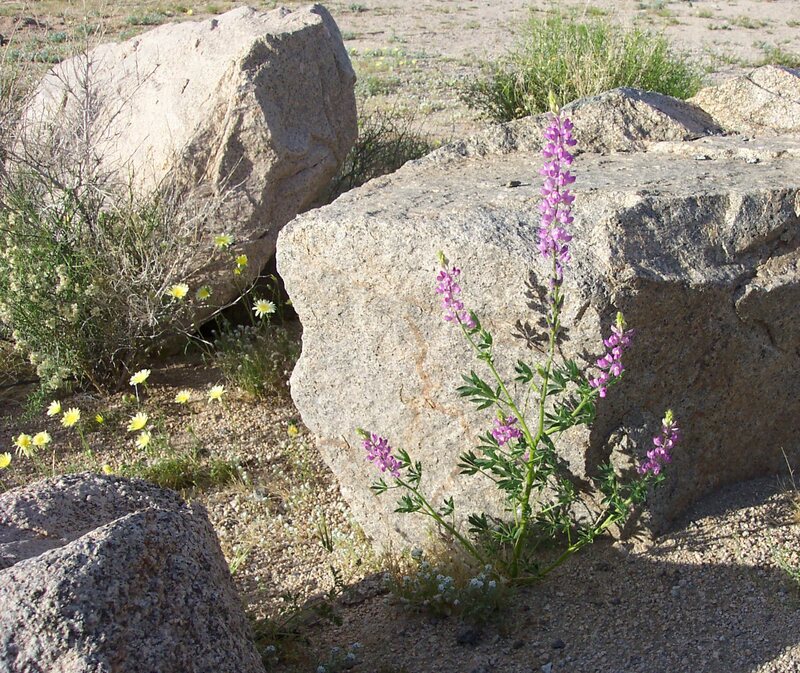 Often plants lie dormant, waiting for water before exploding into color and life. Animals wait out the harsh heat of day to make their appearance, and only at night will a visitors see many animals such as the yucca night lizard, the jackrabbit, and the kangaroo rat. They will be on the lookout for the burrowing owl, the bobcat, and the coyote. A careful, observant visitor will see the desert teem with life. But remember it is a desert. The two parts to the Park, the two deserts, are basically determined by elevation. The eastern half generally belongs to the Sonoran Desert, and you'll see the creosote bush, small stands of ocotillo and jumping cholla cactus. The higher elevations in the north and west are part of the slightly wetter Mohave Desert. 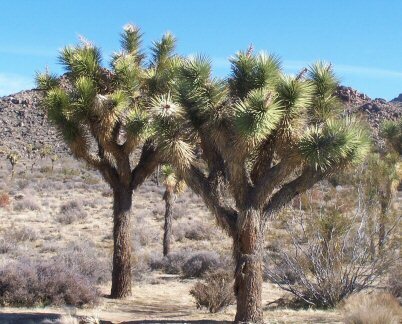 Here you'll find the Joshua tree and several fan palm oases. 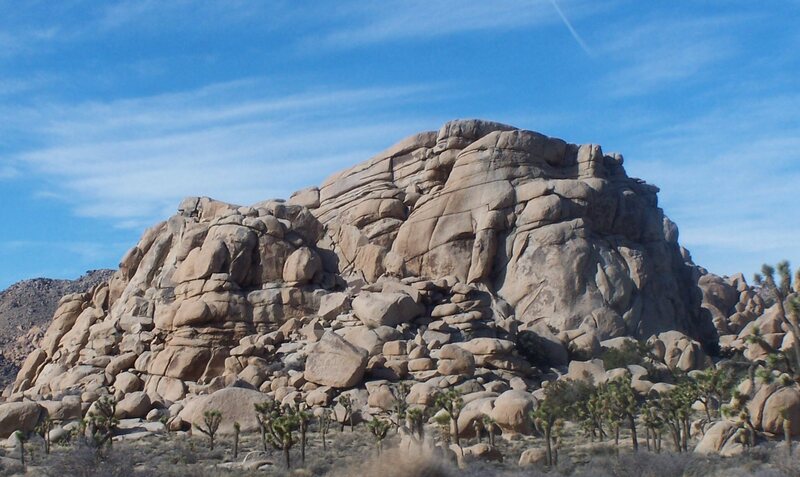 Apart from the cactus and wild animal life, in the park you'll see exposed granite monoliths and twisted rock mountains. The power of the earth's forces, and the strength of water, is evidence in the washes, playas, alluvial fans, bajadas, pediments granites, aplite, and gniess rocks. On cooler days, don't be surprised to see several of the monoliths covered with rock climbers, practicing their skills. The desert has a slow beauty that will grow on you. This is a place to find freedom from everyday routines, and is a refuge for the human spirit. 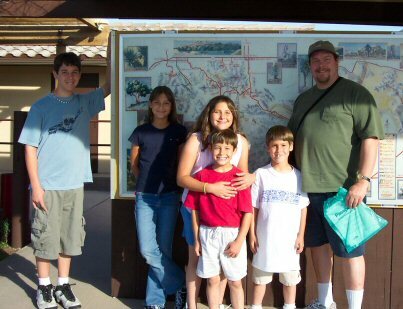 The first time we visited the Park, we came from the south, and so experienced the Sonoran/Colorado desert features. I grew up in this type of desert, so it seemed very familiar to me. As a child, there was a Joshua tree growing in my front yard, along with ocotillos and saguaros and palm trees. 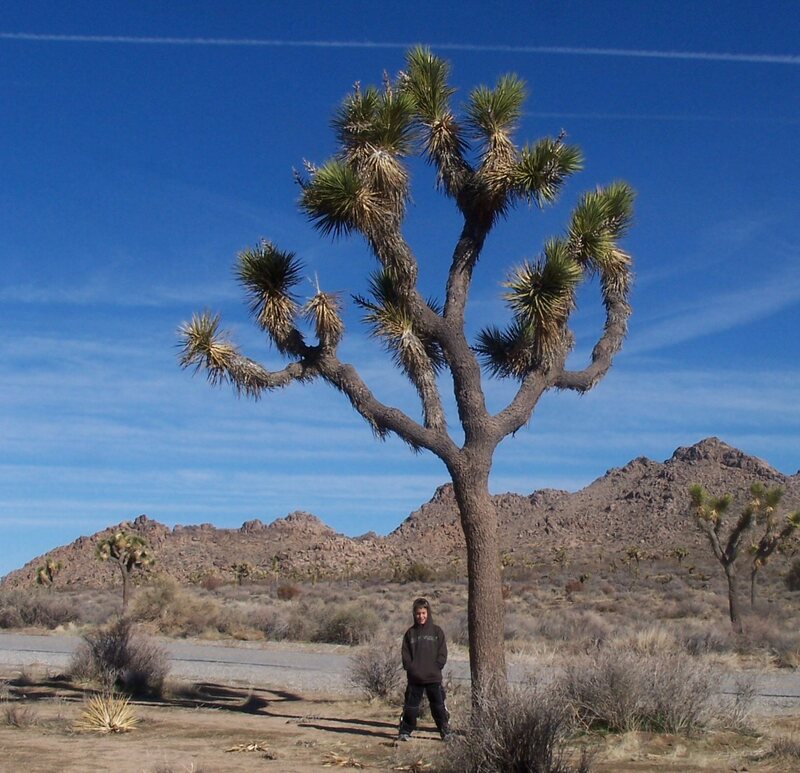 Joshua Tree National Park, to me, is like old home week. I was a little disappointed by what I saw -- this is a National Park? But I kept my reservations at bay, because I know I hadn't seen but a portion. I'm glad I got a chance to see the northern section of the Mohave. It's more interesting by far than the Sonoran desert to the south. In the north you'll find many stands of Joshua trees, you'll find odd and fascinating monoliths of fractured granite, you'll find most of the traces of habitation humans have left here over the last 7,000 years or so. With luck, you may even spot some of the estimated 250 bighorn sheep that roam the Park. In December of 2004, we visited just after four days of heavy rain, and we couldn't count the number of washes that had overrun the asphalt road. But the worst ones had been scraped clean already, and we saw one backhoe/bulldozer busily cleaning a wash as we passed. Rain doesn't come often to the desert, but when it does, it has the power to change the landscape. There's not much for the kids to do, unfortunately. Unless they're used to desert living, parents might think twice about letting them roam unsupervised. Cholla and grizzly bear cactus and other stickery plants can really put a damper on the vacation. There are several short "nature trails" that are illustrated with short informational plaques, however, that allow kids to get out and walk around and, hey, maybe even learn something. But for hikers and campers there are plenty of activities. There are nine established campgrounds, with varying degrees of accomodations, for a total of 497 sites. Each campsite does have tables, fireplaces, and toilets. Ranger-conducted activities are held in the spring and fall. They include ranch tours, evening campground talks, discovery walks, and star parties. There are many nature trails (less than 1.5 miles long), several hiking trails (from 3 miles to 16 miles), and a total of 253 miles of equestrian trails and trail corridors. Remember, it's awfully hot in the summer sun, so plan accordingly. There are three entrances to the Park. From the south, approach on I-10. About five miles west of Chiriaco Summit, take the Highway 195 exit and go north. This road leads directly to the Cottonwood Visitor Center, and winds through the Park to the North Entrance Station and eventually the Oasis Visitor Center. To arrive at the West Entrance, take I-10 98 miles east from Los Angeles and go north on the Twentynine Palms Highway, or Highway 62. Follow it through Morongo Valley and Yucca Valley to Park Boulevard, and follow the signs. 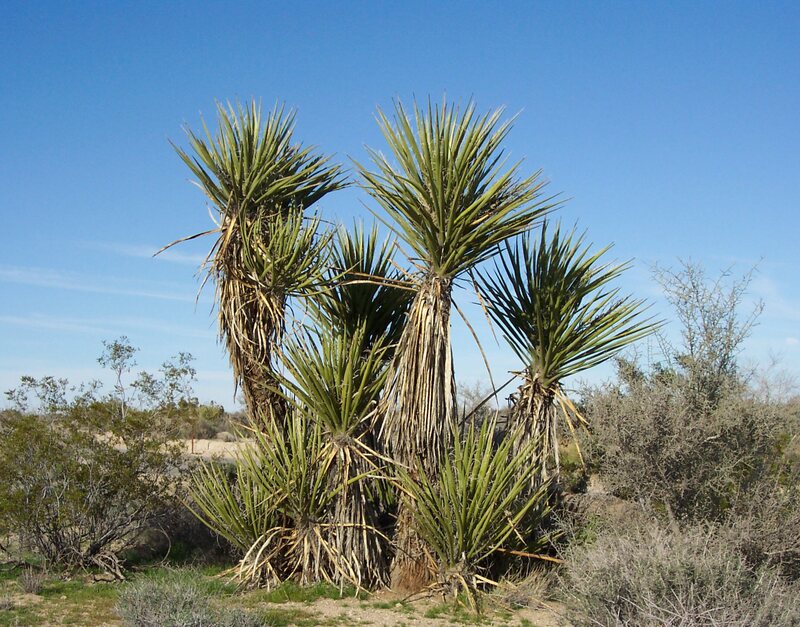 To arrive at the North Entrance Station, take I-10 98 miles east from Los Angeles and go north on the Twentynine Palms Highway, or Highway 62. Follow it through Morongo Valley and Yucca Valley, on to Twentynine Palms. Turn south on Utah Trail; the Oasis Visitor Center, at Oasis of Mars, is a few hundred yards to the south, on the west side of the road. This is the main visitor center. The Park entrance is three more miles to the south. Well, we're stretching the definition of 'Nearby', but about 100 miles north is Death Valley National Park, and about 100 miles to the west is Santa Monica Mountains National Recreation Area, and about 100 miles southwest is Cabrillo National Monument. Since the Pacific Ocean is about 90 miles away at Oceanside, don't forget California Coastal National Monument. 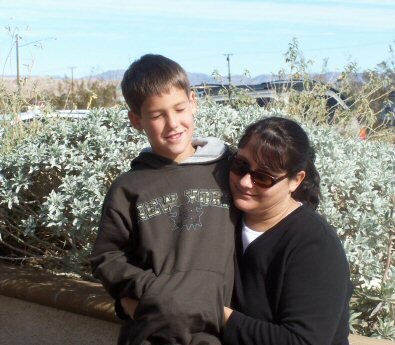 Visited March and December 2004.